Nigeria’s largest online mall, Konga.com is staying true to its commitment of giving shoppers a reason to close the first quarter of the year on a high by making more deals available across all categories on its site. 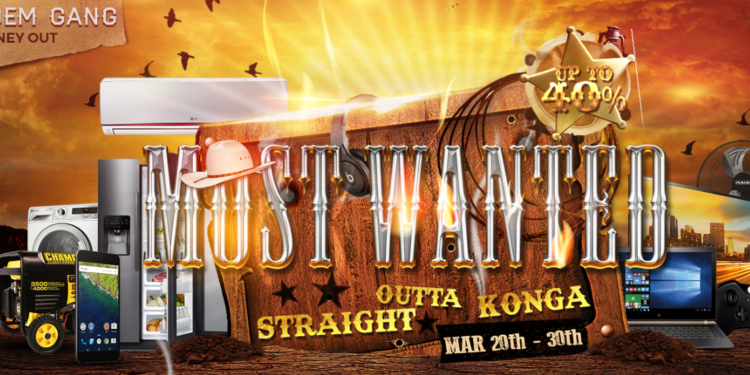 While the ‘Most Wanted: straight outta Konga’ sale has gone halfway with mouth-watering deals already offered, Konga is not resting on its oars, though, and more deals are set to be unleashed from Monday, March 27 until the end of the promotion on Friday, March 31, 2017. Shoppers can enjoy even better discounts than those enjoyed in the first half of the promotion with more deals released across all categories. An eye-catching deal is the Innjoo Android 39 Inch Smart TV which has a whopping 41% discount slammed on it. Another is the Midea Washing Machine MTE60 + Free Tefal Iron which also has huge markdown on it. These and more are products with discounts to help shoppers close the first quarter of the year on a satisfying note and with great deals to match. Konga.com was founded in 2012 by Nigerian entrepreneur, Sim Shagaya; with a guiding mission ‘To Become the Engine of Trade and Commerce in Africa’ and this informed our commitment to a great shopping experience for shoppers.